At last week’s City Council committee hearing on a new sign ordinance, a total of 29 community activists and neighborhood council representatives spoke of their concerns that weaknesses in the ordinance would lead to a proliferation of billboards and digital signs and open up public property, including city parks, to commercial advertising. Also speaking at the hearing before the Planning and Land Use (PLUM) committee were 21 sign industry representatives and lobbyists for business and development groups, all of whom wanted changes in the ordinance to make it easier to put up bigger, brighter billboards and other forms of advertising in more places around the city. Care to guess whose voices were heard most clearly? At the meeting’s end, Chairman Ed Reyes told city planners to come back in two months with revisions that would make it easier to establish the sign districts widely seen as a vehicle for the proliferation of commercial advertising in the city’s public spaces. Reyes also directed planners to recommend ways to set up an industry-funded “sign unit” in the planning department to process applications for sign districts and other sign-related entitlements, as well as study regulation of digital signage and ways the city can get revenue from signage. As for community concerns about the wholesale grandfathering of sign district applications? The possibility of advertising in parks and other public places? The lack of regulations addressing traffic safety, energy use, light pollution, and other issues regarding digital signs? The fact that the latest ordinance version was made public less than a month ago, giving neighborhood councils no opportunity for input? Reyes had almost nothing to say about any of those. To their credit, committee members Paul Krekorian and and Jose Huizar both questioned the ordinance provision that could lead to commercial advertising in parks, although neither commented on other issues. At the end of the hearing, Krekorian said he had many questions, but would wait until the planning department returned with further revisions and recommendations, at a meeting now scheduled for Oct. 18. It’s hard to see how that helps public discourse on the ordinance. Provoking the most heat from the community side of the aisle was the ordinance provision allowing “Comprehensive Sign Programs” to be set up for areas on both private and public property. These programs would allow deviations from citywide sign regulations, including a provision allowing 10 per cent of all signage in the designated area to be for off-site advertising as long as it wasn’t visible from a public street or adjacent property. Comprehensive sign programs aren’t part of the current citywide sign ordinance, but were included in the revised version first approved by the City Planning Commission in March, 2009. In hearings leading up to that approval, the provision was described as a way to allow large-scale developments like shopping malls or college campuses to have their own signage rules. However, off-site signage would not have been allowed. The “grandfathering” of pending applications for sign districts–which can allow digital billboards, building-size supergraphic signs, and other types prohibited citywide–also drew sharp criticism from the community at the PLUM committee meeting. There are currently eight of these, none of which have been considered by the CPC. In addition, there are six specific plan areas for which special signage rules have been requested that wouldn’t be eligible under the new ordinance. Seven of those 14 areas haven’t undergone any planning department processing, and exist only as the designation of street boundaries. What makes this proposed grandfathering so significant is that the CPC-approved ordinance states that property owners in sign districts cannot put up any prohibited sign types such as off-site signs and digital billboards without first acquiring and removing billboards in surrounding communities at a more than one-to-one square footage ratio. Exempting the 14 pending sign districts and specific plan areas from this requirement means the potential for hundreds of thousands of square feet of new commercial advertising without the removal of a single billboard among the many blighting different areas of the city. Additionally, the CPC ordinance greatly limited the geographic areas where the sign districts can be located, and some of the districts now proposed for grandfathering wouldn’t have met this requirement. But even that huge concession wasn’t enough for the lobbyists in the committee meeting room. Several called for alternatives to the billboard removal requirement, suggesting instead community benefits such as “beautification” and “facade improvement.” That’s what apparently got Reyes’ attention, prompting him to ask city planners why this hadn’t been included as an option to the billboard removal requirement. He may have forgotten, or been ignorant of the fact that many community activists involved in the CPC hearings fought hard for this requirement, arguing that if developers were handed a highly lucrative entitlement for signage in sign districts the community should receive a tangible and quantifiable benefit by getting rid of some of the billboards on neighborhood streets. But since when have community voices been a match for the silver tongues of lawyers and other lobbyists who don’t have to take off work or get child care or make other arrangements in order to attend meetings at city hall. Since when have ordinary citizens been able to call or drop in to the offices of the mayor or city councilmembers or heads of city departments and know they will get a receptive audience? Speaking at the PLUM commitee hearing were four attorneys from Latham & Watkins, one of the city’s largest and most politically influential law firms. There were representatives from the city’s three largest billboard companies, Clear Channel, CBS Outdoor, and Lamar Advertising, as well as smaller companies like Van Wagner and Summit Media. 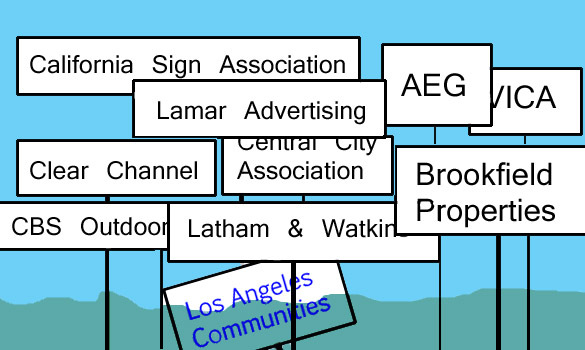 There were lobbyists for business groups and developers, one of whom argued that comprehensive sign programs should be exempt from regulations limiting freeway exposure, ostensibly because owners of freeway-adjacent property shouldn’t be denied the opportunity to broadcast sales pitches for movies, cars, liquor and fast food to the hundreds of thousands of freeway travelers who pass by every day. The City Planning Commission actually tried to achieve a balance, as imperfect as it might have been. That balance is badly tilted in the ordinance that emerged before the PLUM committee hearing, and if Reyes gets his way it will be gone by the time it returns on Oct. 18. In 2002, Reyes voted with the rest of his city council colleagues for a citywide ban on new off-site signs. But three months after that ordinance took effect, he proposed a sign district that would have allowed exceptions for the Hoover-Adams area, fronting on two freeways. That sign district never got to the City Council, but others did, most recently the Wilshire Grand sign district that will allow a new high-rise building downtown to be wrapped with electronic advertising and lighting visible for miles. For Reyes and the lobbyists at the committee meeting, to “stimulate environments for investment” has obviously become the overriding purpose of the sign ordinance, with the city’s visual environment a blank canvas just awaiting more advertising. What that means in terms of citizens’ pride in their communities, what it means in terms of a city people want to live and play and shop and do business in, what it means in terms of the psychological effects of being confronted at almost every turn with the message CONSUME, what it means in terms of what our city will eventually become, is left to those who make the considerable effort to come to meetings and for their trouble are called Nimbys or other unflattering names. Oh, and one more thing. In his closing statements, Reyes said that going forward the planning department would want input from the Recreation and Parks commission. Given that the commission has been trying for almost a year to raise revenue by selling ads in parks, one can guess how that conversation will go.